Over the past few years, the status of English has increased in the financial communication discourse practiced by Dutch multinationals. The fact that a growing number of Dutch companies quoted on the Amsterdam stock exchange introduce an English statutory annual report, clearly marks a shift in their English language policy on annual reports. As for Dutch companies operating internationally, the efficient use of English has become a particular issue with regard to the non­financial texts in the annual report. Within Europe, recent international accounting standards have regulated the financial statements in European based annual reports, causing European multinationals to be increasingly reliant on non­financial annual report texts as a means of distinguishing themselves from their international competitors. This study explores the discourse conventions Dutch and British companies rely on in the design of non­financial texts in their English annual reports. Moreover, it seeks to determine the effectiveness of Dutch­English and British annual report texts from the perspective of international financial readers. 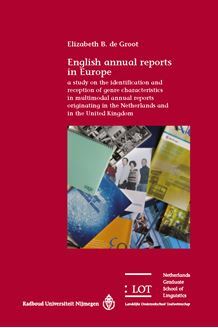 The cross­cultural analysis of discourse includes an integrated investigation of contextual features, content features, structural features and lexico grammatical features in the written texts and photographs of Dutch­English and British annual report sections. Several of the significant cross­cultural differences in discourse are used as variables in the reader response analysis, which shows an overall preference for British conventions in written discourse but also a preference for Dutch­based conventions in visual discourse.